Part of History of Thailand. The kingdom of Ayutthaya (Thai: อยุธยา) was a Thai kingdom that existed from 1350 to 1767. King Ramathibodi I (Uthong) founded Ayutthaya as the capital of his kingdom in 1350 and absorbed Sukhothai, 640 km to the north, in 1376. Over the next four centuries the kingdom expanded to become the nation of Siam, whose borders were roughly those of modern Thailand, except for the north, the Kingdom of Lannathai. Ayutthaya was friendly towards foreign traders, including the Chinese, Vietnamese, Indians, Japanese and Persians, and later the Portuguese, Spanish, Dutch, and French, permitting them to set up villages outside the city walls. The court of King Narai (1656-1688) had strong links with that of King Louis XIV of France, whose ambassadors compared the city in size and wealth to Paris. Conservative factions in Narai’s court, however, were suspicious of the foreigners, and after his death, his successor initiated a 150-year period of relative isolation. In 1767, Burma invaded Ayutthaya, repelled the Ming Dynasty and took back Lannathai, while totally destroying Ayutthaya. This forced the government to relocate to Thon Buri, near present day Bangkok. It was the last of many Burmese invasions of Ayutthaya. The Thais were saved from Burmese subjugation, however, by an opportune Chinese invasion of Burma and by the leadership of a Thai military commander, Phraya Taksin, who proclaimed himself king and established a new capital at Thonburi. The ruins of the historic city of Ayutthaya and "associated historic towns" in the Ayutthaya historical park have been listed by the UNESCO as World Heritage Sites. 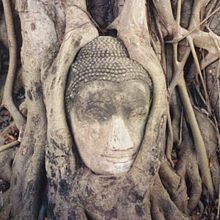 Buddha head overgrown by fig tree in Wat Mahatat, Ayutthaya historical park. The Siamese state based at Ayutthaya in the valley of the Chao Phraya River grew from the earlier kingdom of Lopburi, which it absorbed, and its rise continued the steady shift southwards of the center of the Tai-speaking peoples Its founder, Ramathibodi I (1314–1369, r. from 1351-1369), was known as Prince U Thong before he ascended to the throne. A native of Chiang Saen (now in Chiang Rai Province) he claimed descent from of the Lao royal lineage of Khun Borom. Scholar Charnvit Kasetsiri hypothesized that U Thong might have actually been born to a Chinese merchant family operating in the area of Phetburi. At least one royal chronicle identifies U Thong as the son of one Chodüksethi, apparently a leader of the Chinese merchant community. Ramathibodi's position was likely secured by political marriage and family ties; he was married to a daughter of the ruling family of Suphanburi, and may have also married into an alliance with the rulers of Lopburi. He was probably chosen as a successor of the king of Lopburi. In 1350, to escape the threat of an epidemic, King U Thong moved his court south into the rich floodplain of the Chao Phraya. On an island in the river he founded a new capital, which he called Ayutthaya, after Ayodhya in northern India, the city of the hero Rama in the Hindu epic Ramayana. U Thong assumed the royal name of Ramathibodi (1350-69) on March 4, 1351. He appointed both his brother-in-law and son to positions of leadership in Suphanburi and Lopburi, respectively, and established his own capital in the new city of Ayutthaya. Ramathabodi's reign bound together the Khmer rulers of Lopburi, the Tai in the west, and the Chinese and Malaysian merchants who inhabited the coastal areas. Ramathibodi tried to unify his kingdom. In 1360 he declared Theravada Buddhism the official religion of Ayutthaya and brought members of a sangha, a Buddhist monastic community, from Ceylon to establish new religious orders and spread the faith among his subjects. He also compiled a legal code, based on the Indian Dharmashastra (a Hindu legal text) and Thai custom, which became the basis of royal legislation. Composed in Pali, an Indo-Aryan language closely related to Sanskrit and the language of the Theravada Buddhist scriptures, it had the force of divine injunction. Supplemented by royal decrees, Ramathibodi's legal code remained generally in force until the late nineteenth century. Ramathibodi's death in 1369 sparked a conflict over succession; initially, his son Ramesuan became ruler of Ayutthaya, but Ramesuan later abdicated in favor of Ramathibodi's brother-in-law, Borommaracha. Some sources indicate that the abdication occurred peacefully, while others indicate that Ramesuan's abdication followed a bloody civil war. Ruins of the old city, Ayutthaya, after the Burmese invasion. 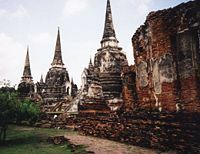 By the end of the fourteenth century, Ayutthaya was regarded as the strongest power in Indochina, but it lacked the manpower to dominate the region. In the last year of his reign, Ramathibodi had seized Angkor during what was to be the first of many successful Thai assaults on the Khmer capital. The policy was aimed at securing Ayutthaya's eastern frontier by preempting Vietnamese designs on Khmer territory. The weakened Khmer periodically submitted to Ayutthaya's suzerainty, but efforts to maintain control over Angkor were repeatedly frustrated. Thai troops were frequently diverted to suppress rebellions in Sukhothai or to campaign against Chiang Mai, where Ayutthaya's expansion was tenaciously resisted. Eventually Ayutthaya subdued the territory that had belonged to Sukhothai, and the year after Ramathibodi died, his kingdom was recognized by the emperor of China's newly established Ming Dynasty as Sukhothai's rightful successor. The Thai kingdom was not a single, unified state but rather a patchwork of self-governing principalities and tributary provinces owing allegiance to the king of Ayutthaya under the mandala system. These countries were ruled by members of the royal family of Ayutthaya, who had their own armies and warred among themselves, as well as self-governing but subservient Malay states in the south. The king had to be vigilant to prevent royal princes from combining against him or allying with Ayutthaya's enemies. Whenever the succession was in dispute, princely governors gathered their forces and moved on the capital to press their claims. During much of the fifteenth century, Ayutthaya's energies were directed toward the Malay Peninsula, where the great trading port of Malacca contested its claims to sovereignty. Ayutthaya was successful, with the military support of Ming China and Japan, who wanted to share the wealth of the trade at Malacca. The northernmost loose confederations of Malay states were not tightly associated with Palembang, the Srivijayan capital. During this time, they stretched all the way north as far as modern day Chumporn, and far south including Pattani. Malacca and other Malay states south of Tambralinga had become Muslim early in the century, and thereafter Islam served as a symbol of Malay solidarity against the Thais. Although it failed to make a vassal state of Malacca, Ayutthaya continued to control the lucrative trade on the isthmus, which attracted Chinese traders of specialty goods for the luxury markets of China. Thai rulers were absolute monarchs whose office was partly religious in nature. They derived their authority from the ideal qualities they were believed to possess. The king was the moral model, who personified the virtue of his people, and his country lived at peace and prospered because of his meritorious actions. At Sukhothai, where Ramkhamhaeng was said to hear the petition of any subject who rang the bell at the palace gate to summon him, the king was revered as a father by his people. But the paternal aspects of kingship disappeared at Ayutthaya. The king was considered chakkraphat, the Sanskrit-Pali term for the chakravartin who through his adherence to the law made all the world revolve around him. As the Hindu god Shiva was "lord of the universe," the Thai king also became by analogy "lord of the land," distinguished in his appearance and bearing from his subjects. According to the elaborate court etiquette, even a special language, Phasa Rachasap, was used to communicate with or about royalty. As devaraja (Sanskrit for "divine king"), the king ultimately came to be recognized as the earthly incarnation of Shiva and became the object of a politico-religious cult officiated over by a corps of royal Brahmans who were part of the Buddhist court retinue. In the Buddhist context, the devaraja was a bodhisattva (an enlightened being who, out of compassion, forgoes nirvana in order to aid others). The belief in divine kingship prevailed into the eighteenth century, although by that time its religious implications had limited impact. The French Abbe de Choisy, who came to Ayutthaya in 1685, wrote that, "the king has absolute power. He is truly the god of the Siamese: No-one dares to utter his name." Another seventeenth century writer, the Dutchman Van Vliet, remarked that the King of Siam was "honored and worshipped by his subjects more than a god." One of the numerous institutional innovations of King Trailokanat (1448-88) was to adopt the position of uparaja, translated as "viceroy" or "underking," usually held by the king's senior son or full brother, in an attempt to regularize the succession to the throne, particularly difficult in a polygamous dynasty. In practice, there was inherent conflict between king and uparaja, and succession to the throne was frequent disputed. The king stood at the apex of a highly stratified social and political hierarchy that extended throughout the society. In Ayutthayan society, the basic unit of social organization was the village community, composed of extended family households. Generally the elected headmen provided leadership for communal projects. Title to land resided with the headman, who held it in the name of the community, although peasant proprietors enjoyed the use of land as long as they cultivated it. With ample reserves of land available for cultivation, the viability of the state depended on the acquisition and control of adequate manpower for farm labor and defense. The dramatic rise of Ayutthaya had entailed constant warfare and, as none of the parties in the region possessed a technological advantage, the outcome of battles was usually determined by the size of the armies. After each victorious campaign, Ayutthaya carried away a number of conquered people to its own territory, where they were assimilated and added to the labor force. Every freeman had to be registered as a servant, or phrai, with the local lord, or nai, for military service and corvée labor on public works and on the land of the official to whom he was assigned. The phrai could also meet his labor obligation by paying a tax. If he found the forced labor under his nai repugnant, he could sell himself into slavery to a more attractive nai, who then paid a fee to the government in compensation for the loss of corvée labor. As much as one-third of the manpower supply into the nineteenth century was composed of phrai. Wealth, status, and political influence were interrelated. The king allotted rice fields to governors, military commanders, and court officials in payment for their services to the crown, according to the sakdi na system. The size of each official's allotment was determined by the number of persons he could command to work it. The amount of manpower a particular nai could command determined his status relative to others in the hierarchy, and his wealth. At the apex of the hierarchy, the king, who was the realm's largest landholder, also commanded the services of the largest number of phrai, called phrai luang (royal servants), who paid taxes, served in the royal army, and worked on the crown lands. King Trailok established definite allotments of land and phrai for the royal officials at each rung in the hierarchy, thus determining the country's social structure until the introduction of salaries for government officials in the nineteenth century. Outside this system to some extent were the Buddhist monkhood, or sangha, which all classes of Siamese men could join, and the Chinese. Buddhist monasteries (wats) became the centres of Siamese education and culture, while during this period the Chinese first began to settle in Siam, and soon began to establish control over the country's economic life,another long-standing social problem. The Chinese were not obliged to register for corvée duty, so they were free to move about the kingdom at will and engage in commerce. By the sixteenth century, the Chinese controlled Ayutthaya's internal trade and had found important places in the civil and military service. Most of these men took Thai wives because few women left China to accompany the men. Ramathibodi I was responsible for the compilation of the Dharmashastra, a legal code based on Hindu sources and traditional Thai custom. The Dharmashastra remained a tool of Thai law until late in the nineteenth century. A bureaucracy based on a hierarchy of ranked and titled officials was introduced, and society was organized in a manner reminiscent of, though not as strict as, the Indian caste system. During his reign, King Trailokanat (r. 1448-1488) made a series of reforms to the government administration, introducing the traditional ministries of Thailand, the Kalahom for the military and the Mahatthai for civilian matters. Also during his reign, in 1454, the hierarchies of the nobility were first codified, petty officials having a sakdi na (field power, with one field measuring 1 rai = 0.395 acre) of 50 to 400, extending up to 100,000 for the uparat (heir-apparent). This system continued until the reforms of King Chulalongkorn at the end of the nineteenth century. In 1468, Trailok adopted a Palatinate law, re-categorizing the cities of Ayutthaya by class. Phitsanulok and Nakhon Sri Thamarat were listed among the eight great first-class cities (Phraya maha nakhon). Mueang Sing, Mueang In, and Mueang Phrom were downgraded to be level-four cities (เมืองจัตวา) under Lopburi. The sixteenth century witnessed the rise of Burma, which, under an aggressive dynasty, had overrun Chiang Mai and Laos and made war on the Thai. In 1569, Burmese forces, joined by Thai rebels, mostly disaffected members of the royal family of Siam, captured the city of Ayutthaya and carried off the whole royal family to Burma. Dhammaraja (1569-90), a Thai governor who had aided the Burmese, was installed as vassal king at Ayutthaya. Thai independence was restored by his son, King Naresuan (1590- 1605), who turned on the Burmese and by 1600 had driven them from the country. Determined to prevent another treason like his father's, Naresuan set about unifying the country's administration directly under the royal court at Ayutthaya. He ended the practice of nominating royal princes to govern Ayutthaya's provinces, assigning instead court officials who were expected to execute policies handed down by the king. Thereafter, royal princes were confined to the capital. Their power struggles continued, but at court under the king's watchful eye. In order to ensure his control over the new class of governors, Naresuan decreed that all freemen subject to phrai service had become phrai luang, bound directly to the king, who distributed the use of their services to his officials. This measure gave the king a theoretical monopoly on all manpower, and the idea developed that since the king owned the services of all the people, he also possessed all the land. Ministerial offices and governorships, and the sakdi na that went with them, were usually inherited positions dominated by a few families, often connected to the king by marriage. Marriage was frequently used by Thai kings to cement alliances between themselves and powerful families, a custom prevailing through the nineteenth century. As a result of this policy, the king's wives usually numbered in the dozens. Even with Naresuan's reforms, the effectiveness of the royal government over the next 150 years should not be overestimated. Royal power outside the crown lands, though absolute in theory, was in practice limited by the looseness of the civil administration. The influence of central government ministers was not extensive beyond the capital until the late nineteenth century. The Thais never lacked a rich food supply. Peasants planted rice for their own consumption and to pay taxes. Whatever remained was used to support religious institutions. From the thirteenth to the fifteenth century, however, a remarkable transformation took place in Thai rice cultivation. In the highlands, where rainfall had to be supplemented by a system of irrigation that controlled the water level in flooded paddies, the Thais sowed the glutinous rice that is still the staple in the geographical regions of the North and Northeast. But in the floodplain of the Chao Phraya, farmers turned to a different variety of rice, the so-called floating rice, a slender, nonglutinous grain introduced from Bengal, that would grow fast enough to keep pace with the rise of the water level in the lowland fields. The new strain grew easily and abundantly, producing a surplus that could be sold cheaply abroad. Ayutthaya, situated at the southern extremity of the floodplain, thus became the hub of economic activity. Under royal patronage, corvée labor dug canals, on which rice was brought from the fields to the king's ships for export to China. In the process, the Chao Phraya Delta, mud flats between the sea and firm land hitherto considered unsuitable for habitation, was reclaimed and placed under cultivation. In 1511, Ayutthaya received a diplomatic mission from the Portuguese, who earlier that year had conquered Malacca. These were probably the first Europeans to visit the country. Five years after that initial contact, Ayutthaya and Portugal concluded a treaty granting the Portuguese permission to trade in the kingdom. A similar treaty in 1592 gave the Dutch a privileged position in the rice trade. Foreigners were cordially welcomed at the court of Narai (1657–1688), a ruler with a cosmopolitan outlook who was nonetheless wary of outside influence. Important commercial ties were forged with Japan. Dutch and English trading companies were allowed to establish factories, and Thai diplomatic missions were sent to Paris and The Hague. By maintaining all these ties, the Thai court skillfully played off the Dutch against the English and the French, avoiding the excessive influence of a single power. In 1664, however, the Dutch used force to exact a treaty granting them extraterritorial rights as well as freer access to trade. At the urging of his foreign minister, the Greek adventurer Constantine Phaulkon, Narai turned to France for assistance. French engineers constructed fortifications for the Thai and built a new palace at Lopburi for Narai. In addition, French missionaries engaged in education and medicine and brought the first printing press into the country. Louis XIV's personal interest was aroused by reports from missionaries suggesting that Narai might be converted to Christianity. The French presence encouraged by Phaulkon, however, stirred the resentment and suspicions of the Thai nobles and Buddhist clergy. When word spread that Narai was dying, a general, Phetracha, killed the designated heir, a Christian, and had Phaulkon put to death along with a number of missionaries. The arrival of English warships provoked a massacre of more Europeans. Phetracha (reigned 1688-93) seized the throne, expelled the remaining foreigners, and ushered in a 150-year period during which the Thais consciously isolated themselves from contacts with the West. During the early twentieth century, Thailand, after learning lessons from Burma–a militarily stronger neighbor that failed to protect itself from Britain in 1885, used a flexible and significantly compromising approach towards its foreign counterparts, including numerous Western nations and Japan. After a bloody period of dynastic struggle, Ayutthaya entered into what has been called its golden age, a relatively peaceful episode in the second quarter of the eighteenth century when art, literature, and learning flourished. There were foreign wars; the Ayutthaya fought with the Nguyen Lords (Vietnamese rulers of South Vietnam) for control of Cambodia starting around 1715. But a greater threat came from Burma, where the new Alaungpaya dynasty had subdued the Shan states. In 1765, Thai territory was invaded by two Burmese armies that converged on Ayutthaya. The only notable example of successful resistance to these forces was found at the village of Bang Rajan. After a lengthy siege, the city capitulated and was burned in 1767. Ayutthaya's art treasures, the libraries containing its literature, and the archives housing its historic records were almost totally destroyed, and the city was left in ruins. The country was reduced to chaos. Provinces were proclaimed independent states under military leaders, rogue monks, and cadet members of the royal family. The Thais were saved from Burmese subjugation, however, by an opportune Chinese invasion of Burma and by the leadership of a Thai military commander, Phraya Taksin. All that remains of the old city are some impressive ruins of the royal palace. King Taksin established a capital at Thonburi, across the Chao Phraya from the present capital, Bangkok. The ruins of the historic city of Ayutthaya and "associated historic towns" in the Ayutthaya historical park have been listed by the UNESCO as World Heritage Sites. 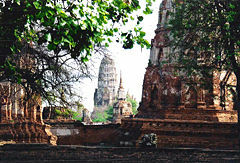 The city of Ayutthaya was re-founded near the old city, and is now capital of the Ayutthaya province. There are 18 versions of Royal Chronicles of Ayutthaya (Phonsawadan Krun Si Ayutthaya) known to scholars. Van Vliet Chronicle (1640)—Translated and compiled by the Dutch merchant. The original Thai manuscripts disappeared. Sanggitiyavamsa—Pali chronicle compiled by Phra Phonnarat, generally discussing Buddhism History of Thailand. Somdet Phra Phonnarat Version (1795)—Thought to be indentical to Bradley Version below. Some of these are available in Cushman, Richard D. (2000). The Royal Chronicles of Ayutthaya: A Synoptic Translation, edited by David K. Wyatt. Bangkok: The Siam Society. 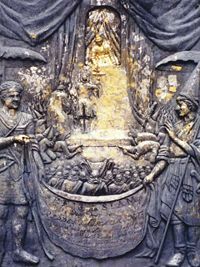 Second Voyage du Pere Tachard et des Jesuites envoyes par le Roi au Royaume de Siam. Paris: Horthemels, 1689. Online Collection Southeast Asia Visions Collection by Cornell University Library. ↑ Chris Baker, Ayudhya Pasuk Phongpaichit. Retrieved December 22, 2007. ↑ David K. Wyatt, "Introduction," Chronicle of the Kingdom of Ayutthaya (Tokyo: The center for East Asian Cultural Studies for UNESCO, The Toyo Bunko, 1999, ISBN 9784896566130). ↑ SU, Rarebook. Retrieved December 22, 2007. ↑ Rarebook, library.tu.ac.th. Retrieved December 22, 2007. ↑ Rarebook, Vol.1 Retrieved December 22, 2007. ↑ Rarebook, Vol.2 Retrieved December 22, 2007. ↑ Rarebook, Vol.3. Retrieved December 22, 2007. ↑ Rarebook, Vol.1. Retrieved December 22, 2007. ↑ Rarebook. Vol.2 Retrieved December 22, 2007. ↑ Cornell University, Southeast Asia Visions Collection. Retrieved December 22, 2007. Charnvit Kasetsiri, and Michael Wright. 2007. Discovering Ayutthaya. Bangkok: Toyota Thailand Foundation. ISBN 9789747025378. Charnvit Kasetsiri. 1976. The Rise of Ayudhya a History of Siam in the Fourteenth and Fifteenth Centuries. Kuala Lumpur: Oxford University Press. ISBN 9780195803136. Chris Baker, Pasuk Phongpaichit. A History of Thailand. Cambridge University Press, 205. ISBN 0521816157. Marcinkowski, M. Ismail. 2005. From Isfahan to Ayutthaya Contacts Between Iran and Siam in the 17th Century. Contemporary Islamic scholars series. Singapore: Pustaka Nasional. ISBN 9789971774912. Maryam, Salim. 2005. The Laws of Kedah, Dewan Bahasa dan Pustaka. Plubplung, Kongchana. The Persians in Ayutthaya. Institute of Asia Pacific Studies, Srinakharinwirot University. Tachard, Guy, and Michael Smithies. 1999. A Siamese Embassy Lost in Africa, 1686 the Odyssey of Ok-khun Chamnan. Treasures from the past. Chiang Mai, Thailand: Silkworm Books. ISBN 9789747100952. Tuanku Nai Long Kassim ibni Almarhum Tunku Nai Long Ahmad. Islamic Epigrafi–The King of Ayuthia Dynasty Kedah Pasai Ma Gangga Nagara. Wyatt, David K. 1999. "Introduction." In Chronicle of the Kingdom of Ayutthaya. Tokyo: The center for East Asian Cultural Studies for UNESCO, The Toyo Bunko. ISBN 9784896566130. Wyatt, David K. 2003. Thailand: A Short History. New Haven: Yale University. ISBN 0-300-08475-7. This page was last modified on 4 May 2016, at 15:03.